Digging in my garden for some isopods, or maybe centipedes, or whatever else I can find (came across some cute rove beetles but I digress), and I found 2 Storeria dekayi under an old bird bath. They were really docile, I'm guessing because it was a chilly morning, and let me pick them up and carry them with no struggle at all. I decided to keep them since we are about to till the garden and this is a very busy area, they stand a better chance with me essentially. I placed them in my "garden" tank...just plants and pill bugs, and immediately they began to mate (oh yea, forgot to mention they are male and female ) which went on and off for about 8 hours. They're viviparous so sometime in mid July I should see babies! The male, I named Patchouli. Nice! 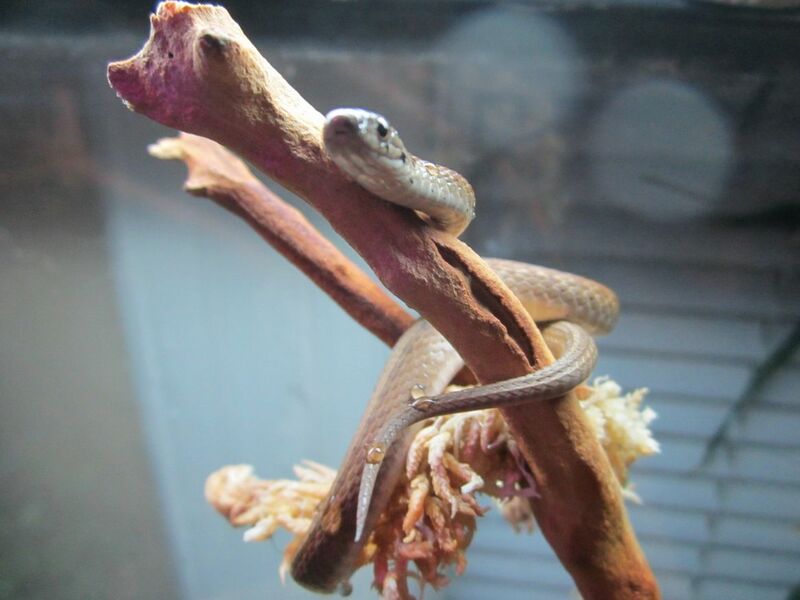 I've got 3 Midland Brown Snakes (Storeria dekayi wrightorum) that I've had for about a year. Besides slugs and worms, they'll eat crickets, too! I haven't tried this yet, but I have a hunch they'll also munch down on cockroaches. I'm going to give that a try in the near future. Very cool. I just found a baby specimen outside my friends apartment a few days ago. I have these large white cinder blocks around my garden. Every spring I flip them and find ring neck snakes, brown snakes and even a pair of pinewoods snakes that have been there for years. This species eats worms, slugs, and some insects. And yes, I agree, poor mice, which is why my other snakes all get frozen mice (I highly recommend if you really want a snake). 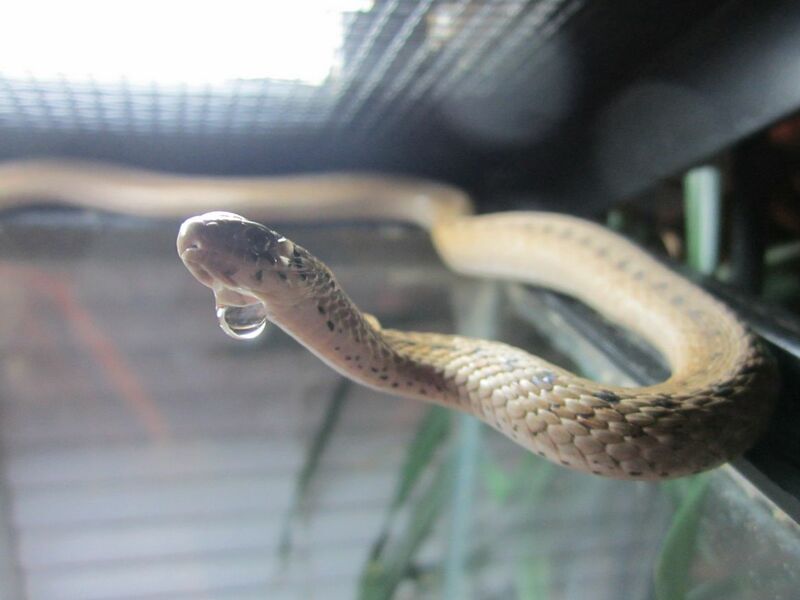 I thought the fun of a snake is watching it kill prey at feeding time, I donated a python to my school in 7th grade and I remember most everyone liking it. I can remember the mouse squeaks of death. You can kill it before feeding so it does not feel pain or injures your snake. I don't trust how fresh the frozen ones are, it would be better to freeze it yourself or bash its head nice and quick before feeding. ...and I've bashed, but I don't recommend...nor will I do it again. And dealing with frozen is just like our own frozen foods...you can tell when they are no good. Are they frozen alive or do they kill the mice first? Pre-killed, death by freezing is cruel. I believe they are killed by CO2. I've bought mice from RodentPro for years and really like their quality and prices. I'm unfamiliar with that company, but I'm definitely going to look into it now! Thanks! No problem and you're welcome! "Storeria dekayi, commonly known as the brown snake"
First line from wikipedia. That's...a really descriptive common name. As for humanely killing mice, sulfur hexafluoride would probably be better. Lungs detect CO2 levels, not oxygen. A high concentration of CO2 will cause your brain to panic as it thinks it's suffocating, as it is in this case. (CO2 mixed with oxygen has been used therapeutically to inducing panic). Any gas other than CO2 and your lungs don't notice and you (mice being the you in this case) will lose unconsciousness and die without panic or fear. Probably prohibitively expensive, though. They trick the mice into sleeping with lower CO2 levels and then increase it to toxic levels. And now for humor, Neil Patrick Harris on sulfur hexafluoride. What cuties! Hope they do well. EDIT: In lab settings, rodents are humanely killed in a process called cervical dislocation (ie, their necks are broken in one quick motion which separates the spinal cord from the base of the brain completely). This kills instantly and painlessly, and is definitely more reliably effective than "bashing" them. If you're going to kill rodents yourself, please learn how to do it in a way that's humane for the animal and not distressing for you. Seeing traumatic violence, even if you're the one doing it and even if it's for a purpose you feel ok with, can be bad for you. EDIT 2: Oops, I should really check the dates on these things before I go resurrecting threads which have been dead for years. Sorry!